This is a reissue of Eric Hill's first and most famous lift-the-flap book in a more deluxe format. It is printed on thicker paper and bound in sturdier cover boards with rounded corners, endpapers with a charming bookplate under a flap, and an elegant matt lamination and spot varnish cover finish. Eric Hill was born in London and attended Pooles Park Elementary and Tollington Park Central schools until the outbreak of World War Two. Prior to the outbreak of hostilities, 12 year-old Eric was evacuated to the small village of Bluntisham in Huntingdonshire. But he returned to London for Christmas and stayed there for the rest of the war. Eric left school at fifteen to start his first job with a shipping office in the City. The following year he joined an art studio as a messenger. This was a bigger break than he had imagined, because at the studio was a well-known Austrian cartoonist, named Tim, who encouraged him to start drawing cartoons. Gradually Eric became more of an art assistant than a messenger and spent more time at the drawing board under Tim's guidance. Tim was a superb artist and cartoonist and later had his own BBC TV show for children. After a stint with the Royal Air Force in Germany, Eric Hill returned to the studio again. His cartooning work began to be published in national magazines and newspapers. He started a weekly strip for the London magazine Illustrated and did small story sketches for Lilliput. After a year of drawing cartoons, Eric Hill left the studio and joined the art department of an advertising agency as a visualiser. The next important step was an appointment with F.H.K Henrion at Erwin Wasey, a large advertising agency in Park Lane. In 1976, Eric's son Christopher was born. When Christopher was two, Eric made up a story to read to him at bedtime about a small puppy. 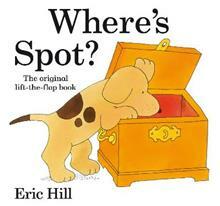 The extraordinary success of Where's Spot?, published in 1980, gave Eric Hill the confidence to work full-time as an author. The second title, Spot's first Walk, was published a year later. The publishing phenomenon that is Spot was born! There are over 40 million books in print read by children in more than 100 countries. The adventures of Spot have been translated into 65 languages, including minority languages such as Inupiaq, Occitan, Frisian and Farosese. Spot has different names around the world including Spotty (Italy), Dribbel (the Netherlands) and Fleck (Germany)! The animated TV series has aired in over 80 countries and the films have been included in the permanent collection of the prestigious Museum of Television and Radio History in New York as an outstanding example of British children s programming. A recent study by UK-based Millard Brown reports that Spot has 99% awareness amongst UK parents and 83% amongst children. In 1983, Eric Hill and his family moved to California. Eric remains involved in the development of all Spot projects at every stage.